GM plans to launch a jointly developed hybrid transmission late next year in the Chevrolet Tahoe (right) and GMC Yukon. Partner DaimlerChrysler will offer the two-mode system in its Dodge Durango (above) in 2008. The cars will be sold in North America. BMW hasn't decided which model will get the joint solution, but said the primary market for its hybrids is the US. BMW, D/C and GM's two-mode heavy-duty, rear-wheel-drive hybrid transmission is a scaled-down and modified version of the gearbox used in GM's diesel-electric-hybrid city buses. In stop-and-go city driving and at low speeds, the two-mode drives the vehicle on electricity using two electric motors encased in what looks like a regular rear-wheel-drive transmission. Power can be sent to the wheels at all speeds by both the electric motor and gasoline engine at the same time. But cruising at highway speeds, power from the gasoline engine alone is transmitted through a series of planetary gears and clutches. Unlike other hybrid transmissions, the two-mode has been designed to pull heavy loads, such as boats and horse trailers. 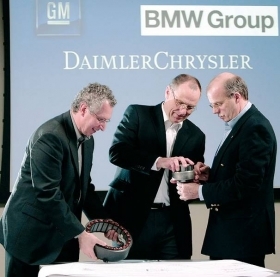 VIENNA -- BMW, DaimlerChrysler and General Motors recently unveiled a jointly produced hybrid transmission that could move big SUVs and large luxury sedans out of the gas-guzzler category. The two-mode rear-wheel-drive hybrid system, made public on April 28 at the International Vienna Motor Symposium, will be available in some of GM's full-sized SUVs and pickups in the US starting next year. As for offering hybrids in Europe, the three companies aren't saying much. GM and DaimlerChrysler won't talk about their plans for hybrids in Europe. BMW may offer a hybrid here in a few years, but is more focused on the US. Presenting the two-mode transmission in Vienna were Wolfgang Epple, BMW's executive director of hybrid programs; Larry Nitz, GM's executive director of hybrid powertrain engineering; and Andreas Truckenbrodt, executive director of hybrid powertrain programs at DaimlerChrysler. Epple, Nitz, and Truckenbrodt spoke with Automotive News Europe at the Vienna symposium about their companies' hybrid programs. Each executive answered the same questions in separate interviews with ANE Correspondent Rick Miller. What kind of hybrids will you introduce and when? Nitz: We are starting out with our own hybrid system in July in the Saturn Vue Green Line. It is a belted, alternator-starter type system where we take the alternator off and we put an electric motor in place that can act as both a motor and a generator. It offers about 20 percent im-provement in fuel economy both for the city and on the highway. Next year we are going to put the system in the Saturn Aura, as a Green Line Aura, and also a Chevy Malibu. There is no plan at this time to sell any of those cars in Europe. Epple: BMW will introduce the two-mode system definitely in the not-too-distant future. In the next three to four years a car will be on the market. The primary target will be the US, but it is also possible that the cars will be available in Europe. It mostly depends on the customer. If there is a big demand, then everybody is willing to satisfy the customers' needs. Truckenbrodt: In Europe, the situation is different because we have this very strong diesel market share, so the question is whether a hybrid of this type [the two-mode] makes sense. Hybrid is a technology that can be applied to diesels, but at the moment it would compete with diesels. That's why we haven't been explicit in really rolling out the hybrid in Europe. Who are your main component suppliers for hybrids? Nitz: The only suppliers that we've talked about publicly are with regard to the Vue Green Line. The battery comes from Cobasys, which is a company in North America. The battery pack is designed in Michigan and it's built in Ohio. Another supplier is Hitachi for the motor generator and the power electronics. Epple: The key components in the hybrid technology are the power control, batteries and electric motors. We are currently in negotiations as far as the battery is concerned. As far as the transmission is concerned, most likely it will come from one of the three partners. Truckenbrodt: We rely on the suppliers, no doubt about that, but we are not into strategic partnerships that really put all our eggs in that one basket. Are you working on a diesel hybrid engine? Epple: We are currently not very deep in the application on the diesel engine, but there is no reason why the two-mode hybrid system could not be fit to a diesel engine as well. Truckenbrodt: Diesel hybrid is an option, and this [two-mode] technology allows it to go with a diesel as well. At the moment, we are not working on it because you are just adding the cost of two expensive technologies. PSA is looking for a partner to develop diesel hybrids. Are you interested? Nitz: We have talked about our [GM/BMW/DaimlerChrysler] co-operation being open to other parties. We would look at partners on the basis of whether they would bring something to our cooperation that is beneficial to us. Epple: Currently we haven't had any detailed discussions on joining forces on that one. Truckenbrodt: What we have always said is that we are open for others to join our cooperation. That means we have talked to nearly all of them, so let's see where that leads us. What will be the price premium on the hybrids you offer? Nitz: The only price premium we have talked about is on the Saturn Vue Green Line [which doesn't have the partner's two-mode system], and that vehicle will be available at about $23,000 (about E18,000). It is about $2,000 more than a comparably equipped non-hybrid, and it represents, I think, an excellent value for a customer. The engine is more powerful and it gets 5 miles per gallon better [2km farther per liter of fuel] in city and highway traffic. Epple: It has not yet been decided. Truckenbrodt: If you look out in the market, the price premium you are getting at the moment is somewhere between $3,000 and $5,000. We don't think we can make it for that price so the cost is higher and business-wise that's a problem. On the other hand, I know that lots of customers are paying a couple of thousand dollars for aluminum forged wheels [on a Mercedes]. So it should be worth paying a reasonable extra amount to get 25 percent fuel savings. Is there a magic number when it comes to the customer premium? Nitz: I think it depends on the vehicle segment and what the value proposition represents. People tend to think that hybrids are valued only on fuel consumption. We don't sell any other powertrain on that value only. Epple: No, there is no magic number. It is a business decision for the individual. If he pays a certain markup for the hybrid and gets a certain benefit from having a hybrid, then he is willing to buy it. Truckenbrodt: We believe that hybrid is not just one, single solution. [One model] might have basic hybrid features, but not the full range of fuel economy, and then there is a top-of-the-line hybrid, which gives you maximum fuel economy and all the features, and there will be a price difference between those two. Does the recent slowdown in hybrid sales in the US worry you? Nitz: Not really. People buy cars for a lot of different reasons, and I think that the media has scrutinized hybrid sales to a point that is probably beyond productive. Sales of all types of vehicles go up and down. Epple: No, because from our point of view, hybrid is part of a bigger picture: the control and the management of energy in the car. We will not stop the improvement of the combustion engine. The combustion engine -- either gas, diesel, ethanol, bio-fuel, you name it -- will be the basis for the future mobility for the next 30 years. All the technologies are, to a certain extent, supportive means for the management of the energy in the car. Truckenbrodt: It does not worry me from the perspective of whether what we are doing is right or wrong. I definitely know that hybrid is the right thing to do. Do you plan to offer hybrids in China? Nitz: We've talked about doing hybrids in China and, in fact, we have a demonstration bus operating in China based on the [hybrid] bus system that we have in almost 500 places in North America. We also are looking at hybrids for passenger cars in China. Epple: There will be a market for hybrids in China, but it will take some time. Truckenbrodt: There are plans and discussions, but it has not been decided yet.